N2 Supplement-A, containing iron-rich human transferrin, was developed for the in vitro differentiation of mouse or human embryonic stem (ES) cells and induced pluripotent stem (iPS) cells to neural and pancreatic-like cell types. 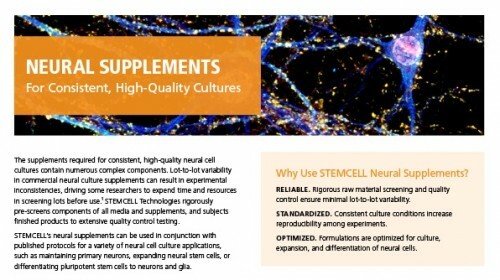 Different neuronal subtypes can be generated when human ES/iPS cell-derived neural progenitor cells are cultured in BrainPhys™ Neuronal Medium (Catalog #05790) supplemented with N2 Supplement-A, NeuroCult™ SM1 Neuronal Supplement (Catalog #05711), and other factors. 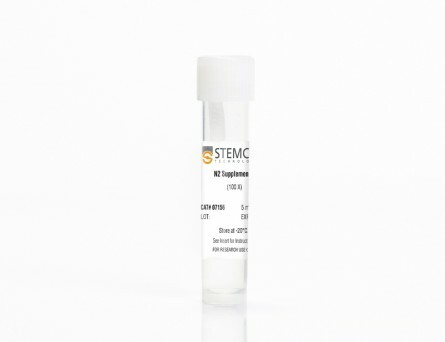 N2 Supplement-A is provided as a 100X stock solution. 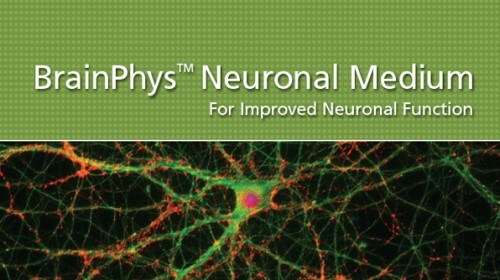 N2 Supplement-A is available for individual sale or as a component of the BrainPhys™ Neuronal Medium N2-A & SM1 Kit (Catalog #05793). M. van den Hurk et al. The human brain is composed of a complex assembly of about 171 billion heterogeneous cellular units (86 billion neurons and 85 billion non-neuronal glia cells). 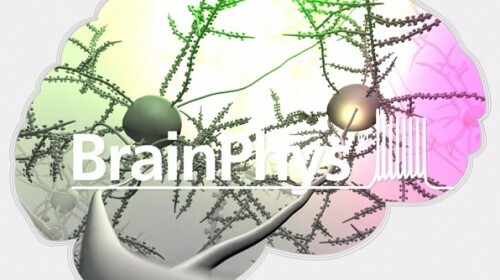 A comprehensive description of brain cells is necessary to understand the nervous system in health and disease. 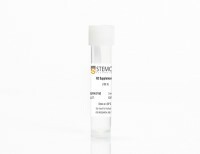 Recently, advances in genomics have permitted the accurate analysis of the full transcriptome of single cells (scRNA-seq). We have built upon such technical progress to combine scRNA-seq with patch-clamping electrophysiological recording and morphological analysis of single human neurons in vitro. This new powerful method, referred to as Patch-seq, enables a thorough, multimodal profiling of neurons and permits us to expose the links between functional properties, morphology, and gene expression. Here, we present a detailed Patch-seq protocol for isolating single neurons from in vitro neuronal cultures. 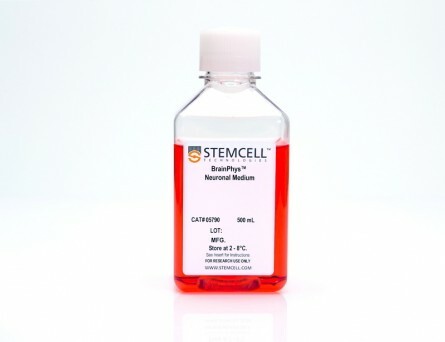 We have validated the Patch-seq whole-transcriptome profiling method with human neurons generated from embryonic and induced pluripotent stem cells (ESCs/iPSCs) derived from healthy subjects, but the procedure may be applied to any kind of cell type in vitro. 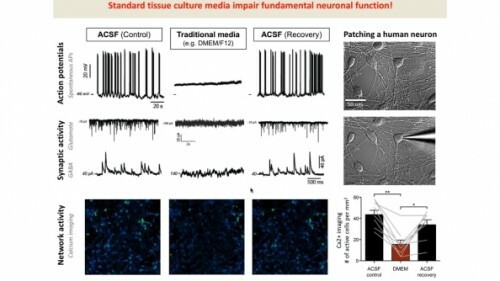 Patch-seq may be used on neurons in vitro to profile cell types and states in depth to unravel the human molecular basis of neuronal diversity and investigate the cellular mechanisms underlying brain disorders. Zika Virus Infects Intermediate Progenitor Cells and Post-mitotic Committed Neurons in Human Fetal Brain Tissues. Zika virus (ZIKV) infection is associated with microcephaly in fetuses, but the pathogenesis of ZIKV-related microcephaly is not well understood. Here we show that ZIKV infects the subventricular zone in human fetal brain tissues and that the tissue tropism broadens with the progression of gestation. Our research demonstrates also that intermediate progenitor cells (IPCs) are the main target cells for ZIKV. Post-mitotic committed neurons become susceptible to ZIKV infection as well at later stages of gestation. Furthermore, activation of microglial cells, DNA fragmentation, and apoptosis of infected or uninfected cells could be found in ZIKV-infected brain tissues. Our studies identify IPCs as the main target cells for ZIKV. They also suggest that immune activation after ZIKV infection may play an important role in the pathogenesis of ZIKV-related microcephaly. Efficient generation of midbrain and hindbrain neurons from mouse embryonic stem cells. 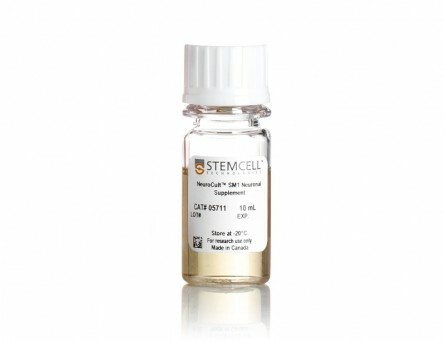 Embryonic stem (ES) cells are clonal cell lines derived from the inner cell mass of the developing blastocyst that can proliferate extensively in vitro and are capable of adopting all the cell fates in a developing embryo. Clinical interest in the use of ES cells has been stimulated by studies showing that isolated human cells with ES properties from the inner cell mass or developing germ cells can provide a source of somatic precursors. Previous studies have defined in vitro conditions for promoting the development of specific somatic fates, specifically, hematopoietic, mesodermal, and neurectodermal. 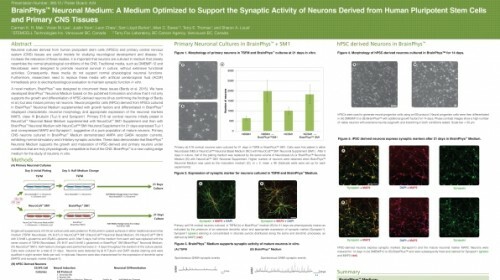 In this study, we present a method for obtaining dopaminergic (DA) and serotonergic neurons in high yield from mouse ES cells in vitro. Furthermore, we demonstrate that the ES cells can be obtained in unlimited numbers and that these neuron types are generated efficiently. We generated CNS progenitor populations from ES cells, expanded these cells and promoted their differentiation into dopaminergic and serotonergic neurons in the presence of mitogen and specific signaling molecules. The differentiation and maturation of neuronal cells was completed after mitogen withdrawal from the growth medium. 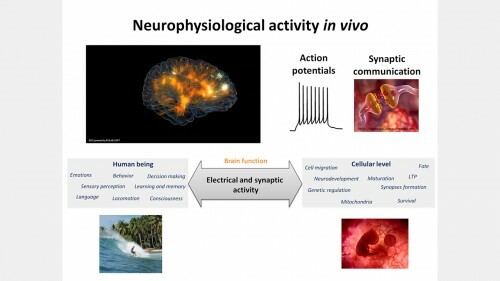 This experimental system provides a powerful tool for analyzing the molecular mechanisms controlling the functions of these neurons in vitro and in vivo, and potentially for understanding and treating neurodegenerative and psychiatric diseases.